If you don't see what you are searching for, please give us a call. 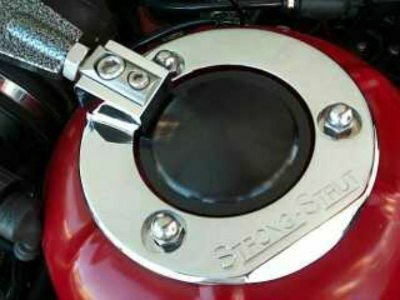 A properly engineered shock tower strut reduces or eliminates the chassis and shock tower flex that occurs during hard cornering and driving over uneven, bumpy surfaces. When used in combination, the Front Strut, Rear Strut and Body Brace sets provide outstanding results and a remarkable improvement in the rigidity of the car. The 3 units acting together contribute significantly to the structural integrity of the car and improve maneuverability by maintaining the proper wheel camber and suspension geometry, providing a much "tighter" and "robust" chassis feel over bumpy roads. Designed to appear as original manufacturers equipment, not like an added aftermarket accessory, built to higher quality standards with superior materials and offered at a much lower price than the competitive products, this discounted combination package sets a new standard in design and value. The stunning appearance will add to the beauty and sportiness of your sculpted Z3 especially with the addition of chrome plating on your front strut brace! This set is CNC-machined from solid aircraft grade 6061 alloy and heat treated to T-6 specifications for added strength, breaking new ground in the alloy strut field by utilizing an exclusive "Direct Block Pivotless Design." Extremely robust and immovable, this design features an extended cross bar that attaches directly to the tower ring block without the need for additional fittings. There are no pivot points, hollow tubes or stamped components in the construction. 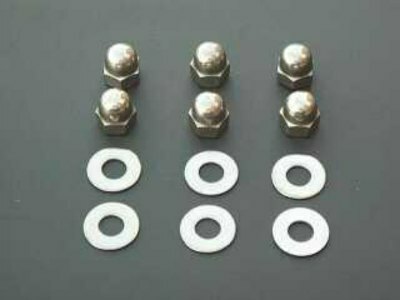 In addition, there is a massive, proven, two inch wide and one half inch thick, machined alloy cross bar with weight saving, decorative, drilled holes. Fits all models of Z3 Roadsters and ///M series including the S54 engine. It does NOT fit 4 cylinder models due to lack of room for the cross bar. The available stock colors are Black and Silver powder coating. Chrome plating is available for the Front Strut Braces only for an additional $300 and will take an additional 3-4 weeks due to the three steps involved in the restoration grade process. A two year warranty is included on the powder coat and chrome plate finishes. 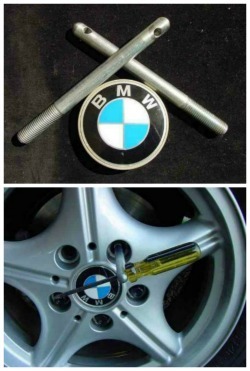 100% Satisfaction Guarantee on the part for the life of the car against fracture or failure (for any unmodified BMWs without after-market performance accessories already installed, not including collisions or deformations of any kind). CLICK on the pictures or titles of the individual products listed below for additional images. Full product descriptions and installation instructions can also be found below each individual product listing below. 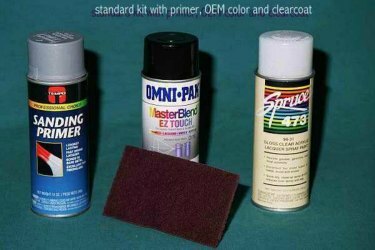 This is the perfect performance package enhancement and a must have item for any Roadster enthusiast! This is an oversized shipment, $30.00 will be added to the normal S/H charges. This is the only bracing product that addresses longitudinal flex of the Z3 chassis, and the improvement in rigidity is very dramatic. Any road surface that otherwise would cause flex (bending) in the center section of the body structure is eliminated. "Thrilling" is the only word to describe the results. The Body Brace consists of two parallel, heavy gauge steel supports that span the entire under section of the passenger compartment and provide the required resistance to add considerable rigidity and greatly improve on the every day driving experience. Handling is substantially sharper as a result of the additional support. The uneven roads or rough railroad crossings that formerly made you wince will no longer be an issue following installation. 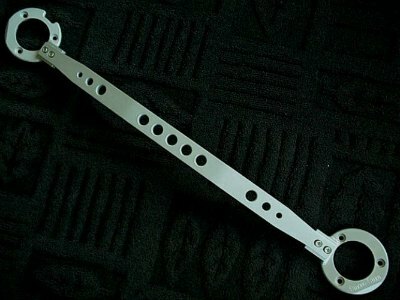 This product will reduce or eliminate the sheet metal flexing that most Z3 owners complain about and is designed to appear as original manufacturers equipment, not like an added aftermarket accessory, built to higher quality standards with superior materials and offered at a much lower price than the competitive products, setting a new standard in design and value. Fits all models of Z3 Roadsters and ///M series including the S54 engine. A Rear Strut Brace IS REQUIRED FOR INSTALLATION of the Body Brace in order to secure the Body Brace supports to the rear of the vehicle. The front of the supports bolt to existing body parts. 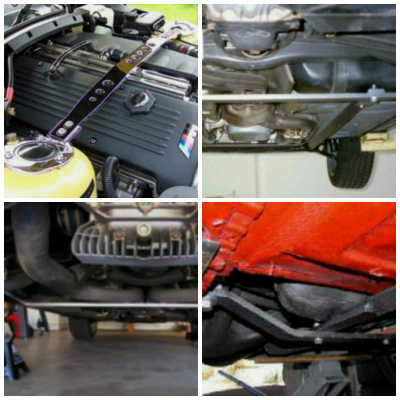 Use of a Front Strut Brace is not required for the Body Brace installation but when used in combination, the three units acting together provide outstanding results and a remarkable improvement in the rigidity of the car. ﻿NOTE: Since there are innumerable after-market suspension products along with wheel, tire and other product combinations that may reduce ground clearance, please be advised the satisfaction guarantee does not include issues related to ground clearance and/or " bottoming out", so be sure you have considered this before placing your order. 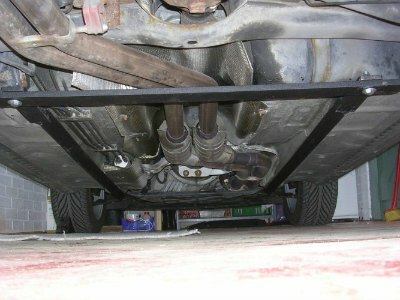 Installation of the Body-Brace may reduce the ground clearance of your vehicle from 1/4 to 1/2 inch. 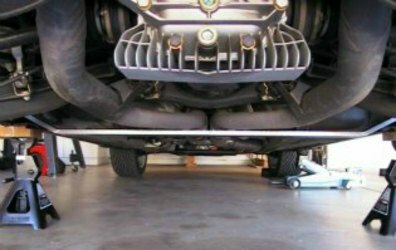 If you have aftermarket suspension products that have lowered your car already, the addition of the Body-Brace may cause you to bottom out on some speed bumps, rolled curbs or other similar obstructions. However, stiffer springs or shock settings may prevent bottoming out due to the shorter suspension travel of these products. The Installation instructions clearly define the optimal installation, and extra spacers are provided to obtain the greatest ground clearance in your vehicle. In some cases, this may not be sufficient to prevent bottoming out under certain conditions. The test vehicle was a 2000 ///M Roadster with a Dinan Stage III suspension kit and is 1/2 inch lower than non ///M Models. In approximately 20,000 miles of road testing under varied conditions, there have been no ground clearance issues on the test car.